This is a larger than average four bedroomed detached family home positioned in this popular village of Owmby-by-Spital, which lies to the north of the historic Cathedral and University City of Lincoln. The property has been extended and greatly improved by the current owners and offers panoramic open countryside views to the rear and side elevation. Internal accommodation comprising of Reception Hallway, Family Room, Dining Room, Lounge, Converted Garage into a Study and Storage Area with Shed attached to the side, modern fitted Kitchen and Breakfast Room, Utility Room, ground floor Shower Room and separate WC. There are stairs to the First Floor Landing with feature full height window overlooking countryside and giving access to the Master Bedroom with En-suite Shower Room and Juliet Balcony, Three further Bedrooms and a luxury Family Bathroom. Outside the property is positioned on a corner plot to the front of the Paddock with double driveway, extensive gardens to the front and side and a courtyard garden to the rear. LOCATION Owmby-by-Spital is a village and civil parish in the West Lindsey district of Lincolnshire. It is situated approx. 2 miles east of the A15, 11 miles north of Lincoln and 8 miles west of Market Rasen. There is a local primary school situated in the neighbouring village of Normanby by Spital and is within the catchment area of local secondary schools. 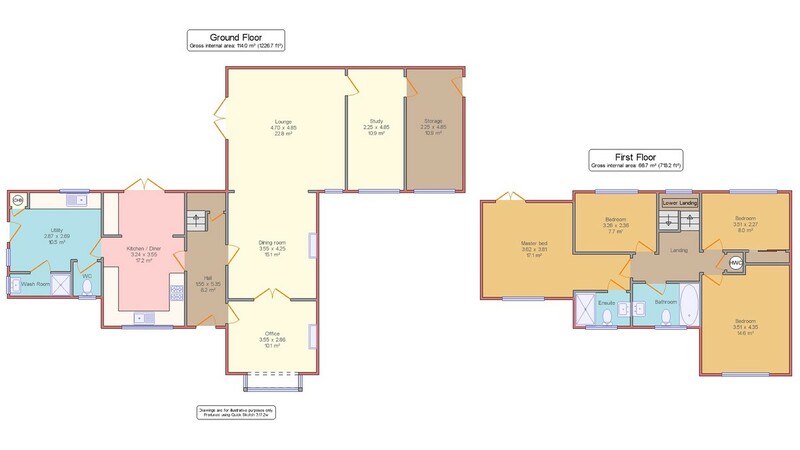 RECEPTION HALLWAY 14′ 4" x 5′ 10" (4.37m x 1.78m) , with door to the front aspect, stairs to the first floor landing with storage below, ceramic tiled flooring, radiator, glass panelled doors to the family room and dining room and a glass panelled stable door to the kitchen. FAMILY ROOM 11′ 4" x 9′ 1" (3.45m x 2.77m) , with UPVC bay window to the front aspect, ceramic tiled flooring, radiator, double glass panelled door to the dining room. DINING ROOM 14′ 0" x 11′ 4" (4.27m x 3.45m) , with archway into the lounge, double glass panelled doors to the family room, a door to the reception hallway, radiator, log burner with tiled hearth and wooden mantel above and wall lights. LOUNGE 15′ 9" x 16′ 0" (4.8m x 4.88m) , with UPVC window to the front aspect, UPVC window and double doors to the side/rear garden, LED spotlights to the ceiling, wall lights and door to the study. STUDY (previously the garage) 15′ 10" x 7′ 9" (4.83m x 2.36m) , with UPVC window to the front aspect, wooden flooring, radiator, access to the roof void area and door to the storage area. STORAGE (previously the garage) 7′ 9" x 16′ 0" (2.36m x 4.88m) , with UPVC window to the front aspect and door to the shed. 11′ 11" x 9′ 10" (3.63m x 3m), with door and window to the side aspect, power and lighting. KITCHEN 10′ 6" x 10′ 7" (3.2m x 3.23m) , with UPVC window to the front aspect, ceramic tiled flooring, fitted with a range of quality modern base units and drawers with work surfaces over, stainless steel sink unit and drainer with mixer tap above and a separate drinking water tap, five ring gas LPG hob with extraction above, self-cleaning Neff oven and combination microwave, space for dishwasher, wall mounted units with complementary tiling below and LED lighting to the ceiling. BREAKFAST ROOM 6′ 9" x 10′ 4" (2.06m x 3.15m) , with UPVC double doors to the patio area, radiator, ceramic tiled flooring, full height storage cupboards and space for fridge freezer. UTILITY ROOM 12′ 1" x 10′ 4" (3.68m x 3.15m) , with door to the rear aspect, UPVC windows to the rear and side aspects, doors to the WC and shower room, ceramic tiled flooring, fitted base units and drawers with work surfaces over, stainless steel sink unit and drainer with mixer tap above, spaces for automatic washing machine and tumble dryer, full height storage cupboards and a concealed oil fired central heating system. WC With UPVC window to the side aspect, WC, towel rail and radiator, partly tiled walls, tiled floor and extractor fan. SHOWER ROOM 8′ 7" x 2′ 11" (2.62m x 0.89m) , with UPVC window to the side aspect, ceramic tiled flooring, suite to comprise of shower, wash hand basin and vanity cupboard and a chrome towel radiator. FIRST FLOOR LANDING With picture UPVC window to the side/rear with countryside views, access to the roof void and doors to the master bedrooms, bedrooms 2,3 & 4, family bathroom and airing cupboard housing the hot water tank, shelving and shower pumps. MASTER BEDROOM 12′ 2" x 13′ 7" (3.71m x 4.14m) , with UPVC window to the front aspect, radiator, UPVC double doors to the Juliet balcony with views over the countryside and fitted bedroom furniture. EN-SUITE 8′ 9" x 4′ 10" (2.67m x 1.47m) , with UPVC window to the side aspect, ceramic tiled flooring, suite to comprise of double shower cubicle, WC and wash hand basin with vanity unit, partly tiled walls, chrome towel radiator and extractor fan. BEDROOM 2 13′ 6" x 11′ 3" (4.11m x 3.43m) , with UPVC window to the front aspect and radiator. BEDROOM 3 11′ 5" x 7′ 8" (3.48m x 2.34m) , with UPVC window to the rear aspect, fitted wardrobe and a radiator. BEDROOM 4 10′ 10" x 8′ 0" (3.3m x 2.44m) , with UPVC window to the side aspect, fitted wardrobe and a radiator. BATHROOM 7′ 9" x 5′ 10" (2.36m x 1.78m) , with UPVC window to the front aspect, vinyl flooring, tiled walls, suite to comprise of bath with shower over, WC and wash hand basin with vanity unit, chrome towel radiator and extractor fan. OUTSIDE To the front of the property there is a double driveway and hardstanding area providing off road parking for numerous vehicles and motorhome storage and raised flowerbeds containing a large variety of roses. To the side of the property at the front there is a vegetable plot with log store and a concealed oil tank and gated access to the rear. To the other side there is a secluded patio area with decorative gravelled beds, rose garden, LPG storage tanks and raised flowerbeds. There is an extensive lawned garden with a wide range of mature shrubs and trees and a summer house. To the rear of the property there is a secluded paved seating area, raised beds, mature shrubs and trees.